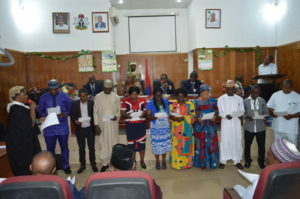 The establishment of Anti-Corruption and Transparency Units (ACTUs) in government establishments by the Independent Corrupt Practices and Other Related Offences Commission (ICPC) has been described as one of the synergies it has developed with public institutions to fight corruption. The Chairman of ICPC Prof. Bolaji Owasanoye stated this at the inauguration of new ACTU members for the Ministry of Defence headquarters, Abuja, recently. Prof. Bolaji, who was represented by the Assistant Commissioner, Corruption Monitoring and Evaluation Department (CMED) of ICPC, Mr. Justin Kuatsea, explained that the unit was a veritable tool which the Commission in collaboration with the Office of the Head of Service of the Federation designed to assist in combating and preventing corruption in Ministries, Departments and Agencies (MDAs). He assured that the Ministry of Defence, which provides administrative and support services to the Armed Forces of the Federal Republic of Nigeria would find ACTU a worthy partner that would play a complementary role in achieving its mandate by ensuring that transparency and accountability were maintained at all times. According to the Commission’s boss, being a member of the unit was not a license to witch-hunt fellow staff or to challenge the management, but that the unit was expected to implement its core functions namely: carrying out systems study and review; preliminary investigations; education and enlightenment of staff on and against corrupt practices, among others. Earlier, the Permanent Secretary of the ministry, Mrs. Nuratu Batagarawa, pledged management’s support, and urged the newly inaugurated members to dedicate themselves to the core values of the unit in order to succeed in their assignment. On her part the new ACTU chairman, Mrs. Winifred Nwokoye, on behalf of other members assured the ministry of their readiness to fight the scourge of corruption.